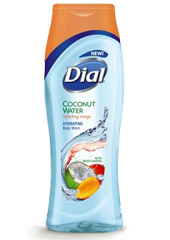 Dial Coconut Water Refreshing Mango Body Wash Giveaway – 3 Winners! Fine Print: I was given a body wash for review and Dial is giving more to readers. All opinions and statements below are my own. Dial has released a brand new version of Ultra Fresh Hydration body wash! Dial Coconut Water Refreshing Mango is the first of its kind to contain coconut water and refreshing mango for clean, healthy and hydrated skin. Let the fresh hints of green coconut and tropical mango whisk your mind away to distant island shores without ever leaving the shower. Coconut water is a leading trend known to be rich in antioxidants and electrolytes that help provide replenishing hydration. Mango is known for being nutrient rich and adds a touch of tropical freshness. I recently got to try this variety and I really like it! The body wash itself is thick and spreads well, so you don’t have to use too much. That means that it should last for awhile! Also, the fragrance is that of a sweet coconut. The coconut scent is definitely dominant, but if you smell your skin closely, you can pick out the hint of sweetness. I think it’s great! To get everyone excited about this new variety of body wash, I am giving three lucky winners a coupon for a free bottle of Dial Coconut Water Refreshing Mango! To enter this giveaway, complete any or all of the options listed below. Giveaway ends 8/17. Good luck! My favorite body wash scent is something floral. I would love to try the coconut water wash though. I could send one along with my dtr to college this fall!! My favorite body wash fragrance is anything fruity– especially coconut! Thanks for the opportunity to try this. I love raspberry and anything tropical. I love vanilla and coconut scents. I love coconut scents or lavender. Vanilla or coconut are my favorites. I love anything citrus like lemon or lime. I’m actually looking for one that I truly like. I don’t have a favorite- I love all good smelling things! I love anything with a beachy coconut smell! Thanks! I like fruity body wash scents. I love cherry and citrus smells for bodywash! My favorite body wash fragrance is lavender. I like herbal or citrus fragrances, but I like to change now and then and try new ones. My favorite body wash fragrance is any kind that reminds me of the beach. I love fruity scents, especially mango. I’d love to try this one! Lavender is always one of my favorites. My favorite body wash scent is likely cucumber melon. I tend to go for fresh, clean scents Usually avoid the bold fruit scents. Japanese Cherry Blossom is the fragrance that comes to mind right now. My favorite body wash fragrance is berry fusion. My favorite fragrance would be vanilla or coconut scents. My favorite body wash fragrance is coconut. Vanilla is my favorite body wash scent. I love jasmine scented body wash! I like a variety and sometimes will switch scents with a half bottle left so I have a lot of partial bottles around. I have a vanilla that I did use the whole thing so I will go with vanilla. Right now my favorite is a pomegranate scent we have in the shower.